During the EuCAP 2017 conference (European Conference on Antennas and Propagation) in Paris, 19-24 March 2017, Optenni Ltd will present a free industrial workshop "WS01: How to design a matching circuit that matches with the measurements?" at 8:40-10:20 am on Tuesday March 21 in room 313/314. This workshop introduces good measurement and simulation practises that greatly increase the likelihood of a first-time-right match between simulated and measured performance. These practises involve VNA calibration, reference plane deembedding in software, layout modeling and use of real discrete component data. 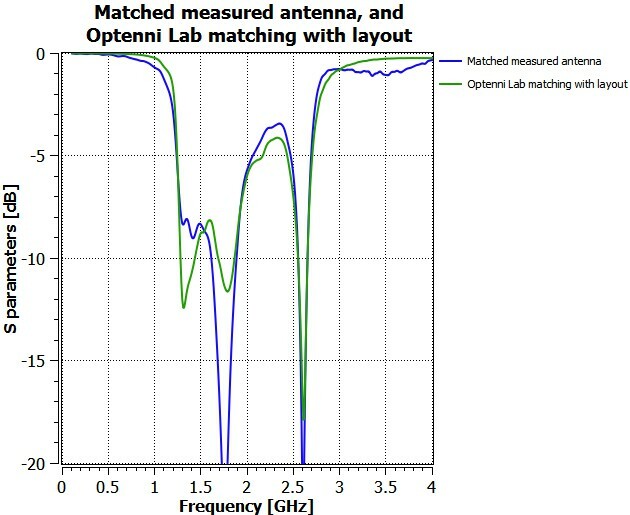 Measured matching circuit performance versus Optenni Lab simulation where matching circuit layout has been taken into account. Optenni will also give a presentation "Combining EM and circuit simulations in the design of tuneable and switchable matching circuits" in the scientific workshop "SWS01: Advances in Commercial Electromagnetic Simulation Tools", taking place in the afternoon of Tuesday March 21 in room 315. On Thursday March 23, in Poster Session 07, at 13:30-15:00 in Corridor Paris we will present a poster on "Dual-Band Lumped Element Decoupling Network Design for Two-Antenna Systems". In addition, please visit us in the exhibition area at booth F8 to see our latest demos and to discuss your needs in matching circuit design.